First of all...Happy Wedding for those who are getting married today, 11.1.2011. This is another late post. Went to have Christmas Eve dinner with my Dear. 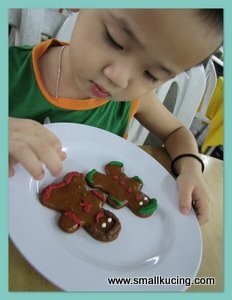 Wah...ngum ngum Auntie Cynthia made a batch of Ginger Bread boy and girl. Can I eat ? Huh...not for eating one ah...for decoration only ya. But luckily we didn't have to wait long for the food to be serve. As for the "waiter" pulak...haiz...*shake head* Kept reminding him there are 5 person and he kept bringing the wrong numbers of "pinggan mangkuk". Kejap bring 3 plates..Kejap bring 4 bowls..kejap 5 forks and kejap 4 spoon. Kelakar betul...like Mr Bean. The first dish was Yam with Pork. Taste ...hmm..okay okay la...It was bit too salty for Mamarazzi, but each person have different idea on saltiness. Portion quite big. Then comes the Sotong. Mamarazzi had intended to post up this post on that night itself to tease Auntie Cleffairy but she was too tired when we got home. 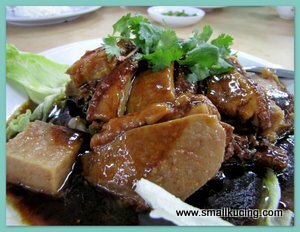 Mamarazzi ordered "Sei Dai Thean Wong". 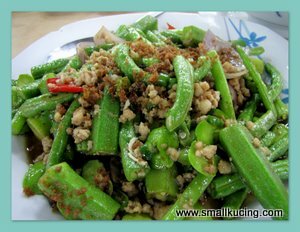 Hmmm..this dish was rather...ahem ahem...ya memang have 4 types of beans but Kacang Panjang and French Bean?? ?..Taste rather not as good as when it's cooked with brinjal. The portion for this dish was very big. I love to drink soup. Hence Mamarazzi ordered "Salted Vegetabe Soup" for us lo. Mamarazzi drank one sip and geleng kepala.Tarak suit her taste. End up korek the things inside to eat only. Didn't drink the soup. See..my Dear eat so "Si Mun". Not even two years old yet and feed herself using fork and spoon. Clever leh? While Mamarazzi said I eat like a dog. Messy messy everywhere. Rice on my baju, rice on my pants and even on my head. Hmm...the usual Chef must have been on leave that night coz we have been to this restaurant before. Previously the food was not bad wor. 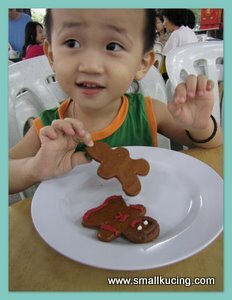 my dream wedding day hahaha love that cookies look awesome sayang nak makan..even the boy also will agree with me i guess..
Ying Jia, not sure is it the same restaurant that i know. 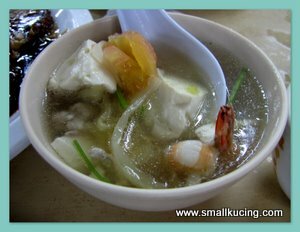 I know there is another Ying Jia Restaurant at Sri Petaling. Ya agree, most important is the company. They didn't put sambal to cook the sei da tien wong? Ehh today is 11.1.11 ler.. not yet november :P hehe..
Hmm can't remember if I have been to this place before. Probably not. But we visit the corner shop along the same road (on the other end away from the Ming Kee Restaurant). Not bad la. 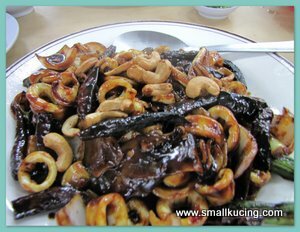 Ya lor, sometimes when the chef left or when he is not in a good mood, the food he cook will taste different leh! Food not so good? Looks very nice leh... Maybe you looked at darling all the time, not paying attention to what you ate. I like Yam dish... yummy! The other end not BKT stall meh?